Children love babies. Whether you have a girl or a boy they love to see little babies, hold them and where possible try to play with them. The girls were super excited when their brother came along and even now he’s a toddler they still love him to bits. The same can be said about dolls. Both boys and girls love to play with them and they are a great toy as well as a wonderful learning tool. Why Should Children Play with Dolls? This newly launched doll brand from IMC Toys is ideal for children. 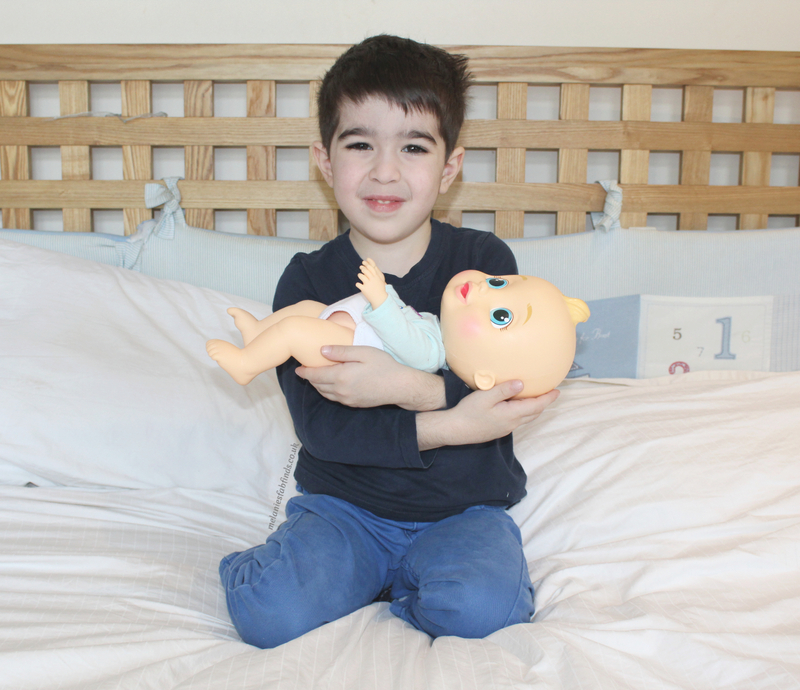 There are 3 different dolls Max, Nick and Alex (all boys) and they cover all the above mentioned areas to help your child develop into a creative and caring little person. Here’s Alex. He’s one of the Baby Wee dolls and like the others is super cute and funny too. Each doll giggles and wees! Both are a must in this day and age and children love toys that are realistic. The doll has a vacuum pump so the first time you use it you will need to prepare it so baby can wee. Make sure the nappy is off. Feed the baby water – see instructions under “Giving the bottle”. Press the valve with the back of the nappy fastener several times until the toy pees. The doll is ready for use. The dolls are easy to use. Simply replace the batteries and let the fun begin. The batteries the doll comes with are for display use so may be empty when the doll arrives. You can feed the baby with the bottle provided, just add water. When you open their nappy for a change…..surprise!!! They wee. The babies will tell you when they are thirsty or need to wee. They make drinking noises when being bottle fed, talk and giggle. There isn’t an on/off switch. The doll will turn off after a period of time without use. Give it a feed or change it’s nappy and it’s awake and ready to drink, talk, play and wee yet again. To make the babies wee you simply feed them water then remove their nappy. Many parents get caught out when changing their baby at first and that’s what happens with Alex. He loves to “let it go……!! !” once the nappy is off, but doesn’t wee for long. Just like a real baby. Make sure you have a towel on hand as little ones will get wet as will the surrounding area. Little Alex is an adorable little baby with a little tuft of blonde hair and enormous cute blue eyes. He makes cute noises and is a toy the children instantly loved. The fact that Alex wee’d all over Squishy’s sister was not only hilarious but also confirmed its place on their favourites list. Even she loved Alex! – Who wouldn’t! Watch Little Miss Getting Wee’d on – Try not to laugh! Want to Win a Baby Wee? We have one Baby Wee to win although which will be a surprise when it arrives!!!! We were sent a sample for consideration. All thoughts expressed are our own. It’s so refreshing to see a boy with a doll, after all, as many boys become fathers as girls become mothers! That’s true and teaching them that it’s a two parent job is a good thing. Your little boy looks so cute! Looks like he loves the doll. He sure does as did his sisters. This is fun to play with. What a great idea, I was never into dolls when I was younger but my littluns are! What a fabulous competition, many thanks for the chance, good luck everybody…. The doll looks adorable, love him. Your son looks very happy. This is a really cute doll, I haven’t seen one like it before. I think this is such a clever idea. I know Leo would absolutely love it! I love this doll it is the right type of cute, I’m not really into dolls which try to hard to look like real babies. I think all children should be given the opportunity to play with dolls. They can develop so many different skills that will be important to them throughout their lives. My daughter would absolutely love this doll. Your son is so sweet! I think my cousin of a similar age would absolutely love this! Looks so much fun to play with. Messing about with water is always popular in our house. This doll sounds really fab! My nephew spud; be fascinated with this as he absolutely loves his new baby cousin! ideal for nannies house, when all the little ones come round! This would make a lovely present for my daughter for Christmas! This looks great, one for the Christmas list! my grandaughter would love this so much! This baby wee doll is very cute! Little Alex is adorable I Love his blue eyes. Lovely giveaway. It is lovely for children (both bots and girls) to play with dolls – it teaches them to look after someone other than their self. Looks like a lovely doll, great to read about the benefits of dolls which boys and girls can gain as I feel too often they’re assumed as just a girls toy and no toy should have a gender! This looks amazing for my daughter this Christmas, and he looks so chuffed it makes me want another for my youngest son! 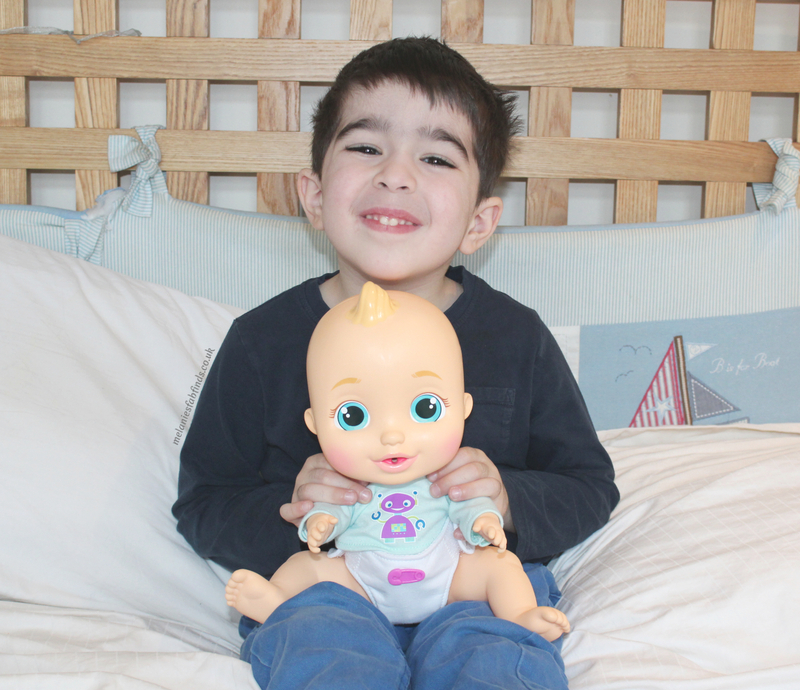 I think having dolls that boys want to play with is a wonderful idea and will help them ‘get in touch’ with their emotions- which is never too early for boys to learn! My niece would love this, as she loves and collects dolls. Wow this looks fantastic great gift idea for my littlest at Christmas 🙂 great way to learn through play! A really cute doll and a fab set of pics. Well done for breaking down stereotypes. It is definitely beneficial. I remember having one of these when I was a child! Lovely dolly for my granddaughter! Great doll! My little niece would love this. I had a doll a bit like this when I was little and had so much fun with it, I think they do help you learn to care for something. My niece would absolutely love this, thanks for the comp! My niece would be thrilled to find this under the Christmas tree this year. Great giveaway, my niece would love this toy. Fingers crossed. Fantastic prize, my niece Sophia would really like this doll. This looks like a nice little doll. I think my niece would really love playing with this. She has always loved dolls, but I think when her little brother/sister turns up, they will become her favourite toy. My daughter would love to take care of this lovely doll. Love the way your little boy has the doll wrapped up in the blanket. He has shiny happy eyes. Proud little bubba. He sure has. He thinks this doll is great. Thank you for this great giveaway i know my niece would love playing with this doll if i was to win. id love this for my niece. it would make the best xmas pressie! your boy is so cute!!! This is so cute! I think Sophie would really like this, she loves her babies. Wonderful prize – thank you for the opportunity! I agree that playing with dolls is wonderful for childrens’ development! I wasn’t lucky enough to have children, so I have a niece and nephews that i spoil frequently. I’m sure that any of them would be thrilled with this. What a great article, showing boys can play with dolls. My nieces are just getting into dolls and would love this! What is it with children and the fascination with bodily functions 🙂 I agree that dolls are fantastic toys for children, and it’s good to see new ones coming out to hold their own with all the tech! I still have my tiny tears doll from over 35 years ago. It is beneficial to children to learn how to care for others and their love for a teddy or a doll encourages this. What a beautiful doll, my daughter will love it. All the children we have to stay would love this. I think it’s great that boys are encouraged to play with dolls, kitchen sets etc nowadays. After all, they need these life skills just as much as girls do. My daughter would really love one of these dolls – they look amazing! Thanks for taking the time to write this excellent post. I’d love the chance to win one for my daughter. Lovely to see dolls are now accepted as suitable for both boys and girls. My children love playing with dolls. My three year old little boy loves them. Fab review… my daughter would love this, she loves pretending to be a mummy! This would make a wonderful Christmas present. Love this , my little boy Peter would love this, he has three sisters and loves playing with dolls. This is such a great prize thank you for the opportunity! My little girl would love one of these dolls!! Fab giveaway, I’d love to win this for my niece. 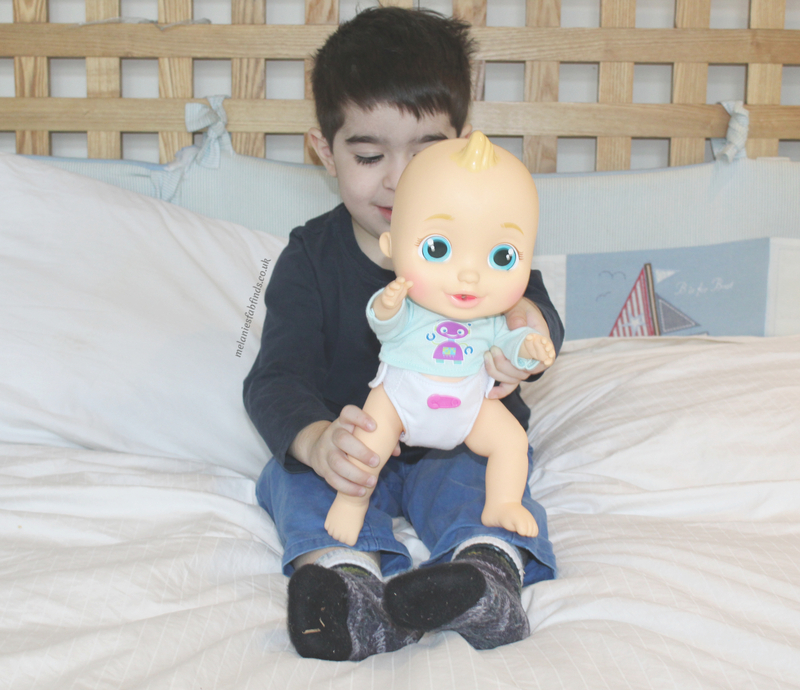 My son loves playing with dolls he has a doll and a pram of his own that he enjoys. Aww this is a lovely prize. Fingers crossed. Last weekend we went to the toy museum in London and saw some amazing dolls and how they have changed through the ages, this doll would be great for my son. Fantastic! My daughter would love to have her own ‘baby’ to look after! Is it just me who finds the large head size of this doll a bit creepy? Granddaughter would love it anyway. I love this doll, really good review. My granddaughter would be thrilled with this. This doll looks great, my daughter would love this. Your son looks so cute with it. This looks great – my cousins would love this! Great Christmas gift. 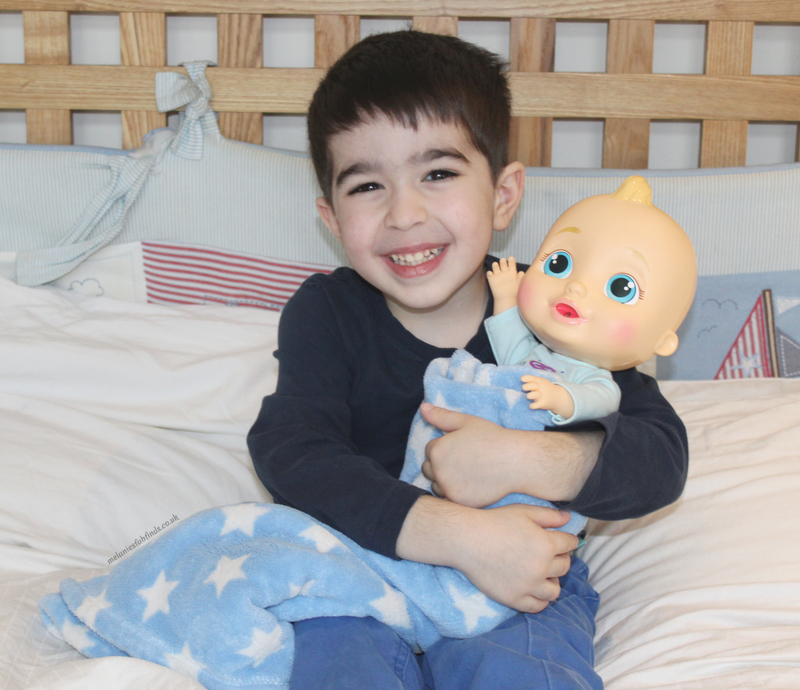 This baby doll looks perfect for young ones and helps teach them how to look after others. My little grandson is 3 in December and I think he would absolutely adore it. It is a great toys for boys as well as girls. Glad more boy dolls are available. Aaahhh thanks. I thought it would be popular as it’s really cute and fun to play with. Lovely pictures! Looks like a toy my youngest would really love looking after. Dolls are great for everyone boys and girls. My little niece would love this. She has just started playing with dolls. Fabulous giveaway! Would love to see it pee on my daughter, she’d find it hysterical. My boys love dolls and a supermarket trip isn’t complete without them pushing the dolls in the pushchairs! Great write up on the doll. My daughter would love it. I can’t keep up with which doll my daughter has asked for but I’m pretty sure this is one she wants from Santa. This looks great, my daughters would both love it! This is a great prize. My Daughter would love it.